As kids (and teachers) head back to school, let’s take a look at two game-changing education apps that can make the classroom a better place. Do you remember bringing home a handwritten note from your teacher? Or scheduling your homework in your paper school diary? Remind is the modern-day version of old-school communication. It lets teachers communicate with students and parents — without sending letters home that often get mysteriously lost in transit. With Remind, teachers can send texts and emails through the app. 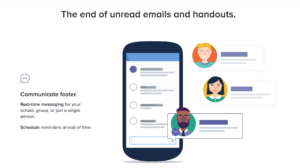 Parents and students experience the convenience of receiving the messages on their devices while Remind protects the teachers’ privacy by hiding their personal information. This makes communication seamless while protecting the private info of those involved. Who doesn’t love a good pop quizz? 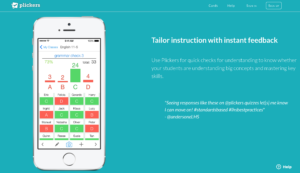 Plickers (Paper Clickers) combines old-school solutions with modern technology to make quizzes fun for both students and teachers. Teachers create a classroom quizz using the Plickers app and, using a projector, they project the questions on the whiteboard (or a wall). Students have simple paper cards with a symbol on either side. They then rotate the card based on whether they think the right answer is a, b, c, or d.
The teacher then uses their phone to scan the room and Plickers scans the cards a bit like a QR code. Then, the app shows you who got the answers right. This makes quizzes so much easier to run and score– no more late-night marking and waiting for the results. Education apps can make learning fun for everyone. Apps like Remind and Plickers make it easier in teachers to benefit from modern tech and engage with their students in an exciting new way. A question for the teachers out there– do you have a favorite ed-tech app? Let me know in the comments!